?? 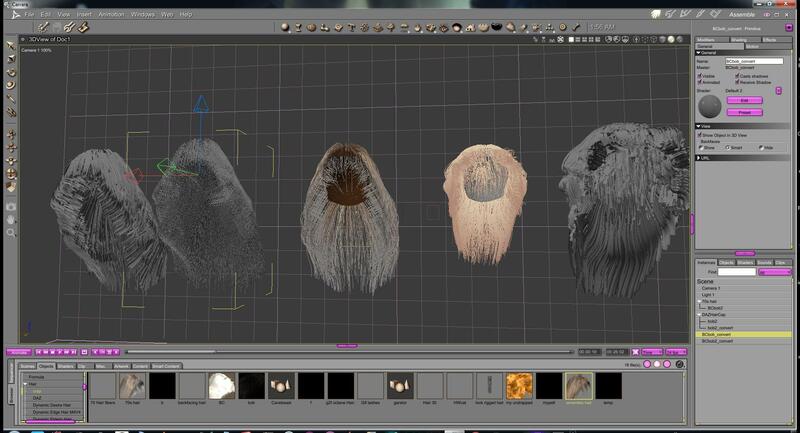 Philemo plugin dynamic hair to mesh ?? I keep losing track of this. Doesn't philemo have a plugin that converts a Carrara dynamic hair to a vertex mesh? It would be perfect for creating a matching hair style for when I want to combine a photoreal render with a toon or NPR render. Also, I'd like to take a Carrara hair style to other programs. 1) Does someone still have the link to the plugin? 2) Does someone still have a link to the forum discussion of potential uses? Sorry to bother again. How does one make it work? Sorry if this is a dumb question. The zip file does not seem to contain an executable. I posted the same question in the main thread for this plugin. It would be better to answer there with the rest of the related discussion. A new version of the hair convertor (Windows at this time, OSX shortly) is avalable at the CTS Project. Strands can be curved at the expense of 2 polygons per segments. The angle between the two sides can be adjusted. An optional third side can be added if necessary (at the expense of yet another polygon). Width is split between root and tip width (to mimic hair that spread at the end or, in the other and, to have pointy hair). Width can be varied ramdomly to avoid too much regularity. There is a slider to fix the amount before and over 100% There is also a random seed so that it won't vary if you use it to create morphs. Parameters are memorized between call so that repetitive actions (trial and error, morph creation) are done faster. I would like to thank publicly PhilW and Diomede for helping me defining those improvements and testing them. Wow! this is one of the best plugins until now, thank you! This is a wonderful plugin. Can't wait to see what some of the hair artists do with it. I can attest that this is a great option for people who like toon and NPR renders. Not only is it possible to convert the base hair, but it is also possible to make movement morphs by brushing the hair and converting again. At least, I ws able to. Thanks again, Philemo - terrific addition to Carrara. I know I will be putting it to a lot of use. Thank you so much Philemo! This is so incredibly wonderful! ...and thanks to PhilW and Diomede for spurring him on!!! what files i need to download? I think OSX is for mac and Win64 for windows 64 bit right? Where do i need to put these files to install the plugin? You're right, OSX is for Mac, but this is still the old version. I've got some problems with my mac book air and I've not yet been able to compile the Mac version. For the Windows version, you just have to unzip the archive in the"extension" directory in your Carrara installation (usually something like"C:\programs\daz 3d\carrara 8.5\extensions\). GMIC Plugin + Hairconverter and Triplanar? This plugin has come on tremendously over the last few weeks and is now much more reliable and useful for producing polygon based hairs. Doing this strand by strand (which is how most hair models are still done!) is tedious in the extreme, and so this method provides a much more natural and easy way to make hair models, which can be used in any other program (including Daz Studio and Poser). I wouldn't be surprised if this plugin by itself attracts quite a few people to using Carrara. @Philemo just wondering, can PyCrowedSim be used in Carrara? Is it some kind of Python Script? took me 5 minutes to get them in the Carrara folder before I realised I had Carrara open..... duh! Yeah... it was really cool before. Now I can't wait to build a new hair to give this new version a shot! So Cool!!! Hi there everyone, been away from here for ages! Just popped by to see whats going on with Carrara these days. Just in time to find a new version of the hair converter. Excellent work Philemo! I've been struggling with Fibermesh recently for a job Ive been doing, bemoaning the fact that I couldnt use Carrara hair to export to 3dcoat. Edit...Here is an old sculpt of "Meg" with converted hair and rendered in 3DCoat. Very cool, Stu! Glad to see you pop in! I think Wendy was referring to the thickness value we can add during the conversion (using the plugin) process. I really wish my current Carrara work wasn't so invisible to the public. Lots going on, experimenting in Carrara with new eyes after studying a whole lot of cinema and vfx theory. Still only dabbling in HitFilm and not even scratching the surface of Fusion (Blackmagic Design), Howler (Project Dogwaffle) has been a dream in helping me to figure out how to get my animated renders looking great. Jeremy Birn's Digital Lighting and Rendering book Third Edition has been a huge help in, well... lighting, rendering and using cinematic camera styles. But my animated renders are turning out really cool! Putting cameras in motion in the past has looked so horrid that I dropped the idea and started just using only still cameras. After doing all of these studies and research, I'm back to moving the camera, but this time the motions are pleasing and help to sell the scene and instigate drama. I also ditched using some of the FX in Carrara in favor of just doing them in post, once I learned how... but after learning more, I'm now back to adding really nice FX into my original renders from Carrara and they're looking great! So these past few weeks have been a real treat for me, getting back into Carrara a lot more than I've been able to in recent times. Just excited again... and it feels Really Good! All of these new plugins coming in are also a boon to the mood and workflow! I love this Hair tool, and am looking forward to (tomorrow?) trying out this newest version. Holidays have kept me from experimenting yet with this one and the new liquids. Really looking forward to diving in though! Rock On, and Happy New Year!!! Wow! Love the improvements and additions, Philemo! They are indeed very good and very welcome! The new OSX version of the hair convertor is available for download. No, it's an unfinished project. It was placed in SourceForge at the request of some Carrara users back then for inspiration. May I use your picture in the sourceforge screencopy page?